Alta Galdana Playa Apartments, Cala Galdana, Menorca, Spain. Budget family accomodation in Menorca. 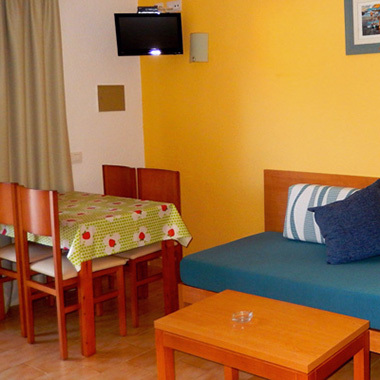 Our apartments offer simple holiday accommodation in one of the best locations on Menorca. If you are planning a quick weekend away, a short break to explore the island or a family summer holiday, Alta Galdana Playa apartments could be the perfect solution. All apartments offer one bedroom (twin) and have a private bathroom (with shower) and small kitchen area. 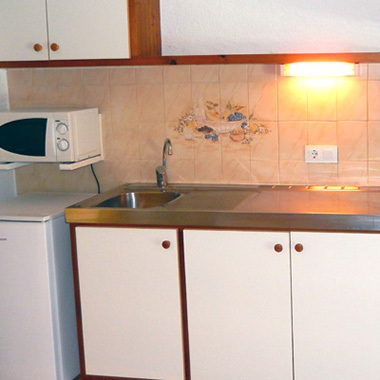 The kitchen is equipped with an electric hob, microwave, fridge & toaster. There is a TV in each apartment and free WIFI. Couples love our location — they rated it 8.8 on Booking.com. All apartments offer one twin bedroom. Each has its own private bathroom (with shower) and small kitchen area. The kitchen is equipped with a ceramic hob, microwave, fridge, toaster & kettle. Wifi is available in all public areas free of charge. Safety deposit boxes are available to hire. 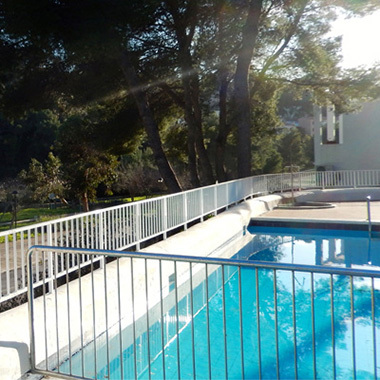 Other facilities on the complex include a swimming pool (with separate section for children) and sun terrace with sun loungers. Due to its hillside location access to every apartment on the complex is via stairs, some quite steep. We therefore advise that this property is not suitable for people with limited mobility.